We have had a ton of calls about carpenter ants getting into people’s homes. Not sure what’s going on but there are at on of ants inside of kitchens, bathrooms, garages, basements, and more. If you’re worried about an ant control problem in your home, then it’s best to trust a pest control expert in the local area to have a consultation with you and decide what is the best next step for you and your family in your home. First we spray the interior and exterior of the home, building a defense to keep the ants out. Secondly, we look for the actual ant nest. If we are able to find it then we will remove it for you at no charge. If it’s not easy to find though, then nothing will be done. We are professional exterminators, we would not do something if we thought that it might not be the best option for our customers. 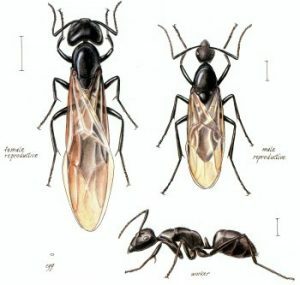 If you’re having a problem with carpenter ants, please be sure to call us at 630-216-4440 to discuss your pest control needs. We are a professional pest control company who can respond fast and efficiently to solve your pest problem. Please do not hesitate to call us. Our operator will help you with your issue and give you the best possible solution at the best possible price around. How Far Can Carpenter Ants Spread? There is no limit to how far a carpenter ant could spread. It’s best to just hop on the issue and solve it right off the bat. You don’t want to see how bad potential ant infestations can get. We’ve seen some really bad ones. Where Do Carpenter Ants Hide? This isn’t the easiest question to answer. Carpenter ants will often have nests outside but they will come into your home seeking adventure, food, or anything else. You will see them in completely random places and there is no consistency as to where they’ll be found. That is why we do a complete interior and exterior spray to ensure that the best defense is built up.